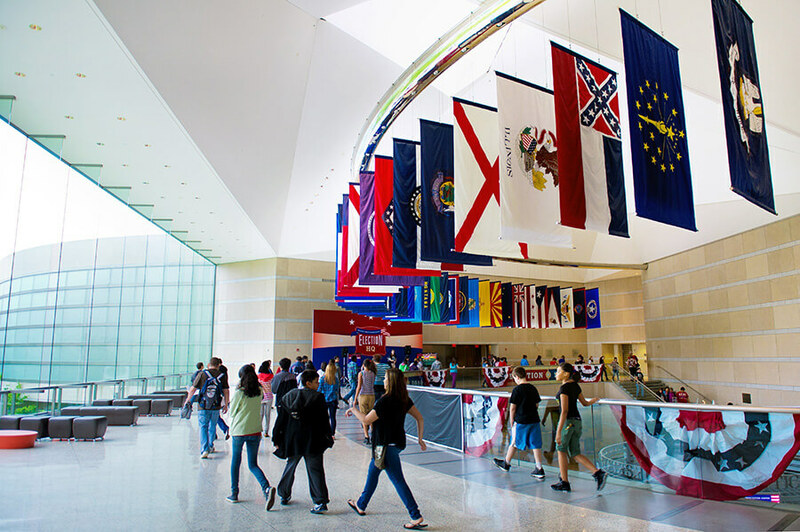 PHILADELPHIA – On May 9, the National Constitution Center’s new permanent exhibit—the first in America devoted to exploring the constitutional debates from the Civil War and Reconstruction—will open to the public. The exhibit will feature key figures central to the era— from Abraham Lincoln and Frederick Douglass to John Bingham and Harriet Tubman—and will allow visitors of all ages to learn how the equality promised in the Declaration of Independence was finally inscribed in the Constitution by the 13th, 14th, and 15th Amendments, collectively known as the Reconstruction Amendments. The 3,000-square-foot exhibit, entitled “Civil War and Reconstruction: The Battle for Freedom and Equality,” will feature over 100 artifacts, including original copies of the 13th, 14th, and 15th Amendments, Dred Scott’s signed petition for freedom, a pike purchased by John Brown for an armed raid to free enslaved people, a fragment of the flag that Abraham Lincoln raised at Independence Hall in 1861, and a ballot box marked “colored” from Virginia’s first statewide election that allowed black men to vote in 1867. The exhibit will also feature artifacts from the Civil War Museum of Philadelphia — one of the most significant Civil War collections in the country — housed at and on loan from the Gettysburg Foundation and The Union League of Philadelphia. A detailed list of confirmed artifacts is featured below, with more being added in the months ahead. “The post-Civil War amendments that emerged during Reconstruction represent the most important changes to the Constitution since the adoption of the Bill of Rights,” said Jeffrey Rosen, president and CEO of the National Constitution Center. “The National Constitution Center is thrilled to open the first permanent gallery in America that will tell the story of how the freedom and equality promised in the Declaration of Independence was thwarted in the original Constitution, resurrected by Lincoln at Gettysburg, and, after the bloodiest war in American history, finally enshrined in the 13th, 14th, and 15th Amendments to the Constitution.” The exhibit will also bring together artifacts, images and interactive elements to tell the stories of African-American officeholders who held local and national elective office during the period following the Civil War, including Hiram Rhodes Revels, Robert Smalls and P.B.S. Pinchback. Along with other multimedia elements, the exhibit will use interactive technology to encourage visitors to explore the creation and drafting of each of the three Reconstruction Amendments. This new experience will be incorporated into the center’s online Interactive Constitution platform, which has received more than 20 million views since its launch and will ensure key content in the exhibit is accessible to classrooms across America.